I’m Kim Ho Leung and I work as an International Leadership Trainer, Speaker, and Mentor. I’ve worked with The Hero’s Journey and personal growth for 10 years. 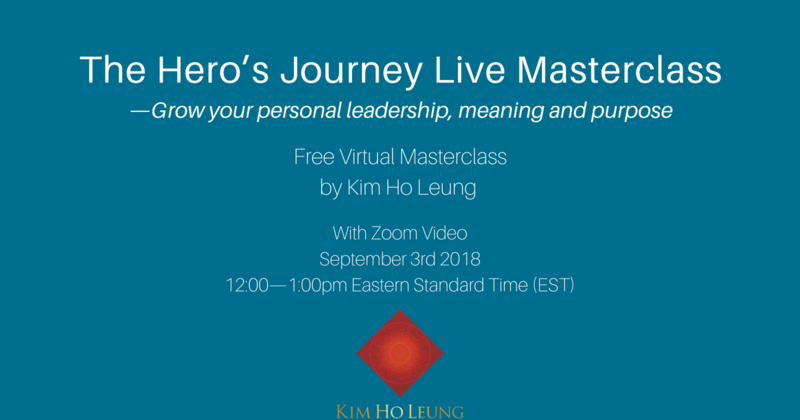 In the online masterclass I’ll talk about the 12 universal phases of the Hero’s Journey. This framework can give you more direction, clarity, and focus in your business and life. The live class will take place on Monday September 3rd 2018, from 12:00—1:00pm Eastern Standard Time (EST). The masterclass will be given with Zoom Video. If you want to grow your leadership skills, meaning, and purpose, and you’d like to explore the 12 steps of your personal Hero’s Journey, this inspiring class can help you. If you’re being called, sign up for this free live class by leaving your name and email in the box below. Once you’ve signed up, you’ll receive an email with all the info. I look forward to meet you Monday September 3rd.